Coming up in a week is a Scottish VMUG meeting scheduled for 26th October 2017. 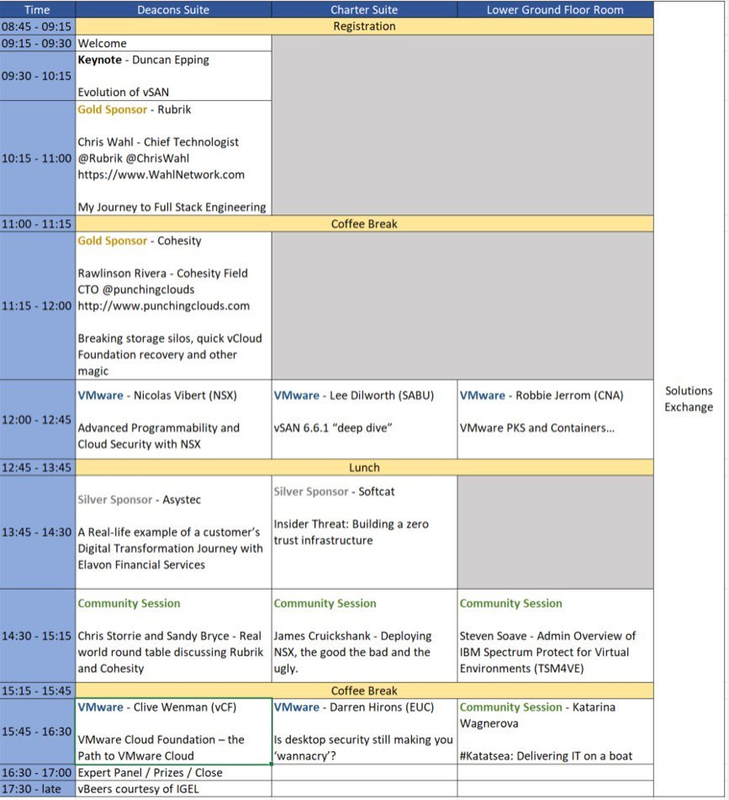 As usual the VMUG Leaders have secured some amazing speakers for an event I am very much looking forward to attending. They have convinced (or in one case bribed with whisky) no less than three VCDX’s to speak. First up we welcome back to Scotland Duncan Epping. As long time reader of his blog and an owner of several of his books I am looking forward to his presentation. Second is Rawlinson Rivera who’s blog I also follow. He is coming as a representative of Cohesity where he will introduce us to the Cohesity product. Finally there is Chris Wahl. I am a big fan as he has such a great blog, podcast and I found his book Networking for VMware Administrators extremely helpful. I see him as the role model Full Stack Engineer and his talk to us will be titled “My Journey to Full Stack Engineering”. Pretty much a must attend event. Darren Hirons - Is desktop security still making you ‘wannacry’? Shout out to community member Steven Soave who answered the call and volunteered to do a talk on IBM Spectrum Protect for Virtual Environments. Also there is a community session from Katarina Wagnerova called #Katatsea: Delivering IT on a boat which should be very interesting. Finally at the end of the day there will be vBeers sponsored by IGEL. I hope to catch up with some of the people I met at the last vBeers. See below the full agenda with timings. If you are there please say hello!